Mithi Connect Xf can very comfortably work with a port level SMTP anti virus scanner configured on the same or another server. Fundamentally, the anti virus scanner software is configured to intercept incoming and outgoing messages, scan and clean these messages and route them to the Connect Server MTA. Please note that the mail filtering system described above will be a second level filter in this case (double check),which can be disabled if required. This document describes both the scenarios and also lists the popular anti-virus scanners. nstall a Linux based SMTP anti virus scanner on the same server where Mithi Connect Xf is installed. Configure it on port 25 (SMTP) and let it relay the scanned and cleaned messages to another port say 1025. 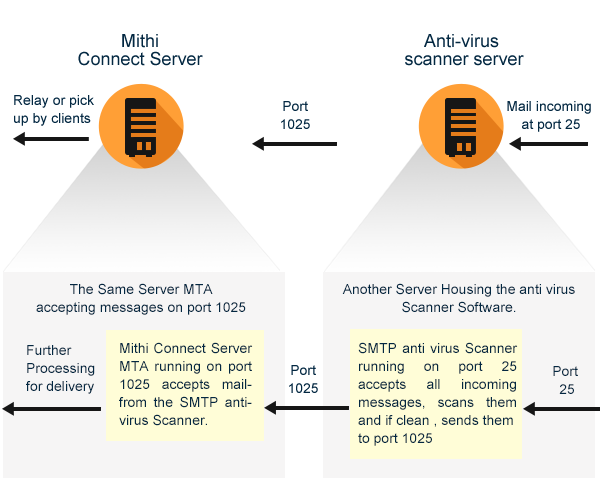 Configure the Connect Server SMTP service to operate on port 1025. 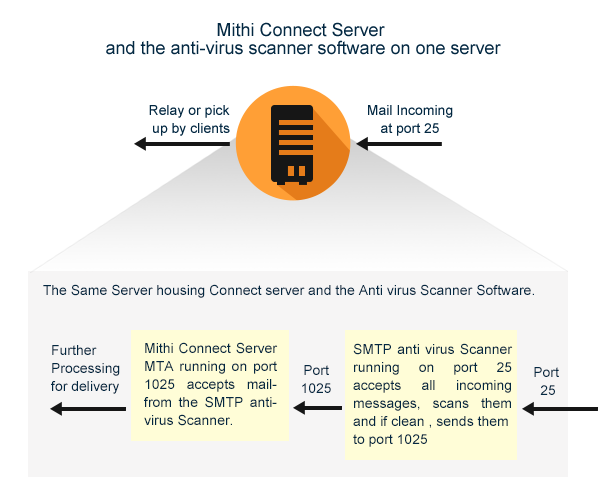 Mithi Connect Xf connects to an anti virus scanner over the standard SMTP protocol. Thus, any anti virus scanner, which operates on the SMTP port, and can relay messages to another SMTP port, will naturally work with Connect Server. Some of the popular choices are Trend Micro-Interscan,Symantec, open source anti virus scanners, CX Protect, etc. The open source components or third party components used in the solution are used as per their respective licensing policies. Some of these components are charged. The customer may have to bear this licensing cost depending on the choice of components.